Embroidered patch measures 1.5" tall, 1.75" wide. Features Demerit Wear's own Peel & Stick adhesive that sticks to (almost) all surfaces, including hard surfaces, synthetic fabrics, and natural fabrics. Stick Demerit Wear Demerit Badges on your helmet, backpack, raincoat, polyester and cotton shirts, bumper, kayak, paddleboard, even your leather jacket! The adhesive is pressure-sensitive, so press HARD! Full adhesion will develop in 3 days. Demerit Badges can then be laundered and tumbled dry on a LOW/Delicate setting. It's as easy as Peel & Stick. 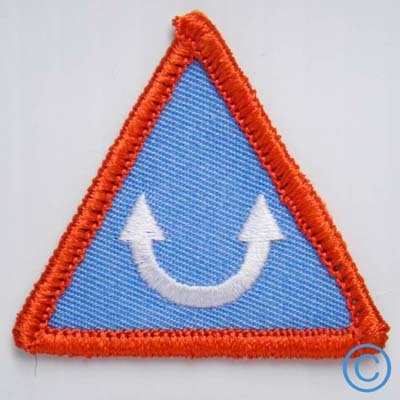 Demerit Wear Demerit Badges are also available without adhesive.